Summary: Sophie Hatter is the first of three daughters, and in the land of Ingary, this can only mean one thing: she is destined to have a dull life running her family’s hat shop. While her two younger sisters Martha and Lettie go off to seek their fortunes, Sophie is resigned to her fate. Until the feared Witch of the Waste walks into the shop and curses Sophie to the body of an old woman. Terrified of anyone seeing her in her current state, Sophie seeks refuge in the moving castle of the wicked Wizard Howl. But all is not what it seems – Sophie is soon caught up in a mess of magic, political intrigue, jealousy, romance, a spoiled wizard’s tantrums, and a fire demon’s contract. In short – despite her best efforts to hide from it – Sophie’s destiny finds her. Cassie-la texted me about Diana Wynne Jones’ death while I was at work on Saturday, March 26th. Not gonna lie, I cried a little bit when I went on my lunch break. Then I went out to the stacks and picked up Howl’s Moving Castle, one of my favorite books. It is a comfort read; something I can blast through in about three hours but still walk away with a ridiculous smile plastered across my face. I don’t even know how many times I’ve read it, but I manage to love it more with every reread. Diana Wynne Jones was a master of fantasy. Hers are the books I compare every other fantasy book to, and very few can achieve the same level of beauty, humor, and humanity that her writing always contained. Now I know I have probably said it like a million times, but I like fantasy only if it’s grounded in humanity. Because in worlds ruled by magic and whimsy and non-science, the characters need to have limitations based on their traits. This is where Jones was absolutely brilliant – she wrote more believable characters than most realists could ever dream of. Let’s start with the Wizard Howl himself. He has a wicked reputation in the town of Market Chipping, where Sophie and her family live. It’s said he eats the hearts of young girls after luring them to his moving castle. And this is partially true – except it’s more like he romances them and then immediately loses interest as soon they love him back. He is also a sulky baby at times, throwing fits by making the castle fill with green slime that Sophie must clean. And boy is he vain, spending hours in the bathroom as he prepares to go a’courtin’. There’s a scene in which he mistakenly dyes his hair pink that makes me giggle madly every time. Despite his reputation and all of his flaws, he really does care about people. He helps the poor people of Ingary, and loves his niece Mari fiercely. As Sophie describes him, he’s slithery. Trying to get out of situations but still managing to do the right thing. He’s just a giant commitment-phobe. And a bit of a heart-breaker. But while I am madly in love with Howl (how could you not be?) the best character has to be Sophie. Maybe because it’s easier to identify with a girl hiding from adventure than a really handsome wizard, but it’s so easy to read Sophie’s narrative. She is scared to death of stepping outside of her role, told that as the oldest sister she will never amount to anything besides inheritor of the family business. The only way she can leave is in disguise, and even that wasn’t her personal choice. She had to have her adventure thrust upon her by the evil Witch of the Waste. Once she is in the castle and hidden in the body of an old woman, Sophie truly comes alive. She realizes that she will soon die if she doesn’t break the curse, and so she stops acting like the mousey oldest sister and is just herself. Probably for the first time ever. She is bossy and sassy and a bit jealous of all those girls Howl is going after. And she finds that she has magical abilities as well, enough to hold her own against Howl. Diana Wynne Jones, you were a sneaky lady. I thought this book was *just* a fantasy adventure, with magic and wicked witches and moving castles and fun. But it’s so much more – it’s a story encouraging you to stray outside the roles defined by your surroundings. A story about going out and living while you can – because who knows when the Witch of the Waste will visit you in the night. But unlike Sophie, we won’t get a second chance once she comes. And finally – it’s a story about love. About putting your heart and soul into the equation. Otherwise, you could end up talking to hats while your moving castle passes you by. Yes, you can find all of that and more inside of Howl’s Moving Castle. (And all of her other wondrous novels.) So thank you Diana Wynne Jones for your beautiful, hilarious, tricky, and romantic stories that remind us what it means to be human. You will be deeply missed. This post put a lump in my throat. Well done Dippy! 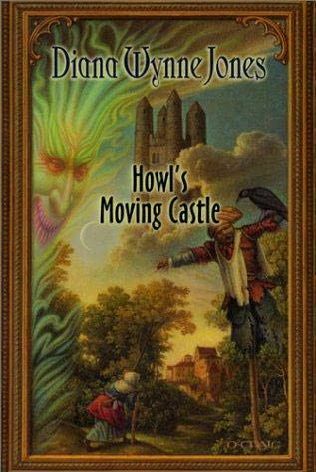 “Howl’s Moving Castle” is actually the only Diana Wynne Jones book that I’ve read, and it was recommended by Cassie-wa. I really need to reread it. What other books by her would you recommend? Thanks darlin’. This one made me sad while writing it, so I apologize for the heaviness. And the Chrestomanci books are all amazing! I think you would really like them. I borrowed them all from Cassie-Wa lol in very quick succession because they were that good. But now I am sad again because there won’t be any more…. But well we must be happy with how prolific she was. I think I’ve only read about half of her books actually. She has so many!